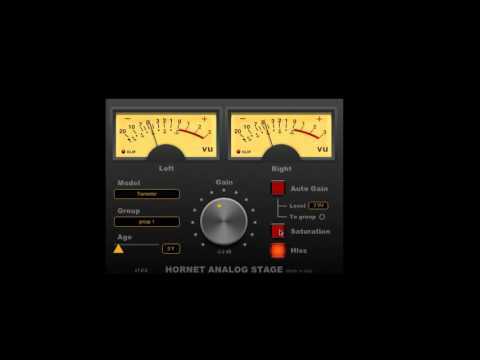 HoRNet AnalogStage emulates those sound characteristics usually associated with analog gear (saturation, hiss, non linear frequency response, etc.) and can be used to bring to your mix some analog console flavor if used on every channel or buss. AnalogStage simulates the response of three different types of analog technology: operational amplifiers (the cleanest and more modern technology), transistor (the discrete transistor designs were popular in the 70s and have some fat saturation) and tube (the dynamic and smooth saturation of the past). Every one of the three different type of emulation can be used inside the same project but for convenience you can create up to eight group of instances so that any change to the emulation type, age, hiss switch and saturation switch is applied to every plugin belonging to the group. AnalogStage also provide a stereo VU meter calibrated to -18dBFS to help you gain stage the plugin and to help you even more we added our latest auto gain technology. We also added an “age” slider that can make your virtual console older simulating the effect of drying condensers, this affect both the saturation amount and the frequency response. Three different types of emulation: op.amp., transistor and tube. Instances can be grouped so a parameter change is applied to the whole group. Age control simulates the aging of the analog device changing saturation and frequency response. Adjustable input gain from -18dB to +18dB. Stereo VU meter calibrated to -18 dBFS. Separate saturation and hiss controls. Audio Units, VST, VST3, RTAS and AAX format. I love this plugin it is fantastic for gain staging a mix the three different types of emulation are great and the saturation and hiss control come in handy as well. 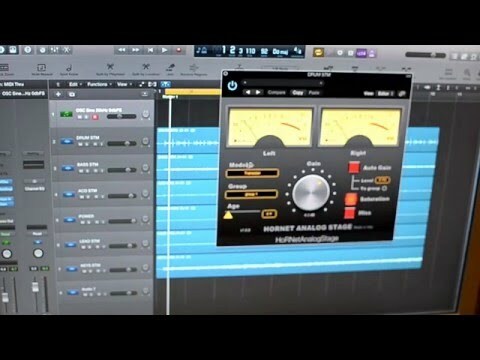 For the price of this plugin you can't go wrong I use it now on all my mixes. Love it..
sounds great just opening it….brings clarity and detail to things i hadn't imagined …not just warmth and distortion. this will be a mainstay device for sure….thanks HORNET for such a great product! As someone who has used classic analog and currently uses consoles(not so classic) every day. I really do like this plugin A LOT.. The age section where you can choose basically how old the components you are using are and the headroom that basically lets you choose how much it has till it distorts and starts coloring the sound, and it does indeed distort like real gear… real gear for those of use who has used it does actually crap out eventually you can push it hard but when you actually hard clip gear it sounds really bad but if you listen to the subtle saturation on multiple tracks before you actually crap out he channel… well that is what people mean by driving a console. is one thing I would love to see added. and I will put that in the end. Overall its a great plugin with one thing I would love to see added. 1. A drive knob dedicated to just saturation so I could keep the gain I like something at but still actually drive the plugin to saturate more. That would make this even better!! Rich & warm sounding. Lovely on drums & busses. Great flexibility. I really like this plugin. I like that it does a few things really well and leaves me free to add eq etc to the chain. If it had a frequency based mono-iser it would be even better! I'm using this plugin more and more. Its indispensable for fine tuning tracks to sit pretty in the mix with minimal tweaking. Much thanks! I own a few saturation plugins but I have to say this one is my favorites ! Being able to age the tube & transistors is a nice feature and the grouping feature is brilliant! I like to put in on all my tracks and mix into it. This is a great little plug in use it now on so many projects uses hardly any CPU and is good for gain staging a mix as well as adding it's A warmth to a track if you want or if you don't . Pretty much a go to all the time so useful love it. I use this on almost everything. Adds an analog bite and warmth I love. Really good value!